Today's card is the first I've created with the Designer Tin of Cards stamp set from Stampin' Up! It was the set I won in Prize Patrol at OnStage last month. As the name suggests, it coordinates with a kit, which I can't wait to get my hands on. Thankfully there's just a few more days until the new catalog launches! Labels: Bitty Butterfly, Designer Tin of Cards, Elegant Butterfly, Lots of Labels, Papillon Potpourri, Stampin' Up! Beautiful. 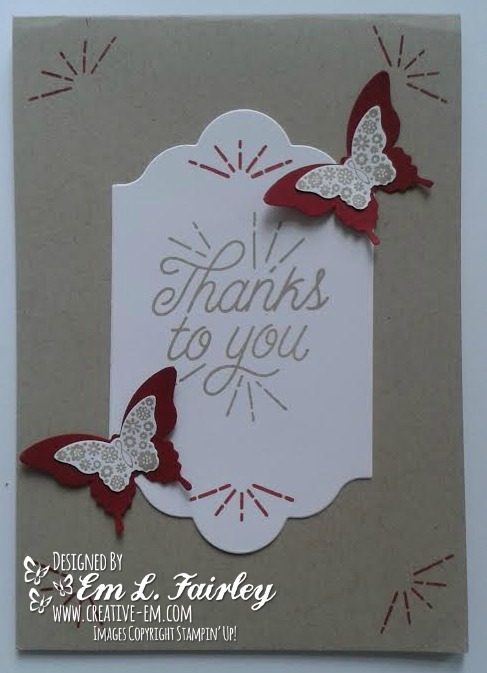 Love the sweet butterflies and the lovely colour combo you used! This is gorgeous, loving the butterflies. Gorgeous card Em, love the design and love those butterflies.